Metropolitan Opera - Marnie Event homeCustomer reviews HamiltonThe PromNetworkTo Kill a MockingbirdKiss Me KateHadestownOklahoma! Why See Metropolitan Opera - Marnie? Based on the novel by Winston Graham and subsequent silver screen classic by Hitchcock, Nico Muhly's Met Opera-commissioned Marnie is a brand new opera that breaks the traditional mould with its sweeping, cinematic scope and rapidly moving action. Helmed by Tony Award winning director Micheal Mayer (the man behind 2007 Broadway smash Spring Awakening), the thought-provoking psychological thriller examines freedom, redemption and the ties that bind. The stories titular character, played by Grammy Award-winning mezzo-soprano Isabel Leonard, is an enigmatic young woman whose attempts to escape the repressed traumas of her past culminate in multiple identities and embezzlement as she hops from one city to the next. When she meets business man Mark, played by British baritone Christopher Maltman, his relentless pursuit of her sets off a harrowing series of events that uncover Marnie's mysterious past. Seen Metropolitan Opera - Marnie? Loved it? Hated it? Sound good to you? 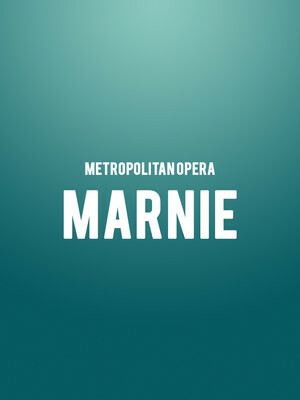 Share this page on social media and let your friends know about Metropolitan Opera - Marnie at Metropolitan Opera House. Please note: The term Metropolitan Opera House and/or Metropolitan Opera - Marnie as well as all associated graphics, logos, and/or other trademarks, tradenames or copyrights are the property of the Metropolitan Opera House and/or Metropolitan Opera - Marnie and are used herein for factual descriptive purposes only. We are in no way associated with or authorized by the Metropolitan Opera House and/or Metropolitan Opera - Marnie and neither that entity nor any of its affiliates have licensed or endorsed us to sell tickets, goods and or services in conjunction with their events.